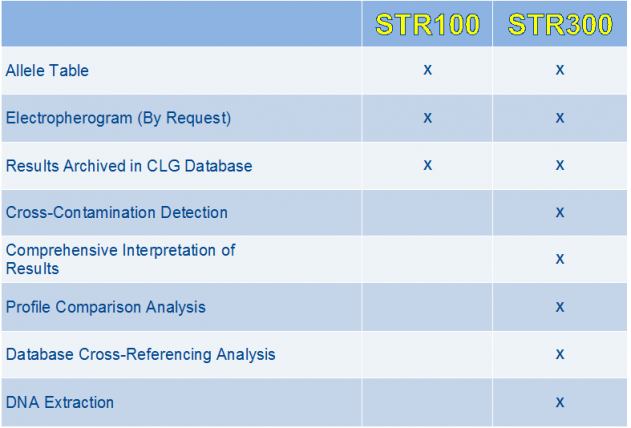 Cell Line Genetics offers two levels of STR Profile analysis—STR100 (basic) and STR300 (comprehensive analysis). Both are designed to accommodate your needs throughout all stages of your stem cell research including cell line derivation, propagation, and long term culture. All STR services include STR profile storage in CLG's secure, encrypted database for future profile comparison analysis, and 24 hour access to reports on our secure cloud database at no additional charge. Short tandem repeat polymorphisms (STRs) are detected by utilizing Promega's PowerPlex® 16 multiplex STR system which detects STRs for 15 Codis loci plus Amelogenin—the same system used by the FBI and other government forensic labs.